Karnataka is one of the highest economic growth states in India with an expected GSDP (Gross State Domestic Product) growth of 8.2% in the fiscal year 2010–2011. The total expected GSDP of Karnataka in 2010–2011 is about ₹2719.56 billion. Per capita GSDP during 2008–2009 was US$1034.9. Karnataka recorded the highest growth rates in terms of GDP and per capita GDP in the last decade compared to other states. In 2008–09, the tertiary sector contributed the most to GSDP (US$31.6 billion─55 percent), followed by the secondary sector ($17 billion─29 percent), and the primary sector (US$9.5 billion─16 percent). With an overall GDP growth of 56.2% and a per capita GDP growth of 43.9% in the last decade, Karnataka surpassed all other states in India, pushing Karnataka's per capita income in Indian Rupee terms to sixth place. Karnataka received US$2,026.4 million worth of Foreign Direct Investment for the fiscal year 2008–09, placing it at the third spot among states in India. At the end of 2004, the unemployment rate of Karnataka was 4.57% compared to a national rate of 5.99%. For the fiscal year 2006–07 the inflation rate of Karnataka was 4.4%, which was less than the national average. Between 2011-12 and 2017-18, the GSDP of the state grew at a Compound Annual Growth Rate (CAGR) of 13.11 per cent to reach ₹12.69 trillion (US$ 196.88 billion) and the net state domestic product (NSDP) grew at a CAGR of 12.83 per cent to reach ₹11.45 trillion (US$ 177.68 billion). A fiscal year in Karnataka begins on 1 April of the previous calendar year and ends on 31 March of the year with which it is numbered. After Bangalore urban district, Dakshina Kannada (Mangalore) and Belgaum district contribute the second and third highest revenue to the state respectively. 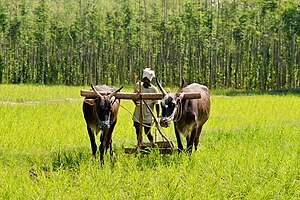 Agriculture is the primary occupation of most of Karnataka's rural residents. A total of 123,100 km² of land is cultivated in Karnataka, constituting 25.3% of the total geographical area of the state. According to the 2001 census, farmers and agricultural labourers formed 56% of the workforce of Karnataka. Agriculture in Karnataka is heavily dependent on the southwest monsoon since the extent of arid land in the state is second only to Rajasthan. Only 26.5% of sown area (30,900 km²) is subjected to irrigation. The state has three agricultural seasons – Kharif (April to September), Rabi (October to December) and Summer (January to March). The main crops grown are Rice, Ragi, Jowar (sorghum), maize, and pulses (Tur and gram) in addition to oilseeds and a number of other cash crops. Cashews, coconut, arecanut, cardamom, chillies, cotton, sugarcane and tobacco are also produced. Karnataka is the largest producer of coarse cereals, coffee, raw silk and tomatoes among the states in India. Horticultural crops are grown in an area of 16,300 km² and the annual production is about 9.58 million tons. The income generated from horticulture constitutes over 40% of income generated from agriculture and it is about 17% of the state's GDP. In floriculture, Karnataka occupies the second position in India in terms of production and 700 tons of flowers (worth ₹500 million) were produced in 2004–05. A majority of the thirty-five billion rupee silk industry in India is headquartered in Karnataka State, primarily in Mysore and North Bangalore regions of Doddaballapura, the site of a planned 700 million "Silk City". Karnataka is one the largest concentrations of higher education including medical and engineering colleges. Apart from Bengaluru, places like Mangalore, Belagavi, Mysuru, Hubballi-Dharwad and Davanagere have been producing professionals for the Information Technology industry. Muddenahalli, in North Bangalore, is the site of the upcoming Sri Sathya Sai Baba University and College of Medicine and a branch of the Visvesvaraya Institute of Advanced Technology. Devanahalli is set to be the location of a 95 billion Devanahalli Business Parks, which will contain Aerospace Education Special Economic Zones, near the Bengaluru International Airport. The North Bangalore region is set to be a premier educational hub of Karnataka. Dharwad in the northern part of the state is another hub for education with several engineering colleges and a central university. These developments are set to contribute significantly to Karnataka's economy by creating jobs, expanding educational opportunities, and spurring infrastructure development. Karnataka evolved as the manufacturing hub for some of the largest public sector industries of India after India's independence. Hindustan Aeronautics Limited which is dedicated to research and development activities for indigenous fighter aircraft for the Indian Air Force employs over 9,500 employees making it one of the largest public sector employers in Karnataka. Other heavy industries such as National Aerospace Laboratories, Indian Telephone Industries, Bharat Earth Movers Limited (BEML), Bharat Electronics Limited, Hindustan Machine Tools and Indian subsidiaries of Volvo and Toyota are also headquartered in Bangalore. India's national space agency, the Indian Space Research Organization (ISRO), is headquartered in Bangalore and employs approximately 20,000 people. TVS Motors has a motorcycle manufacturing plant at Mysore and Tata Motors at Dharwad. Karnataka state has many companies engaged in the manufacturing of electrical equipment and machinery like Kirloskar, ABB, Kavika, Larsen and Toubro etc. This may be due to the location of the Central Power Research Institute (CPRI) at Bangalore. Many multinational companies have set up their manufacturing units in Karnataka such as BASF, and Bosch. The state owns sugar factories in the northern region, edible oil processing factories, pharmaceutical factories, textile processing centers, and steel producing facilities. Vishwesharaiya steel plant at Bhadravati is run by SAIL. Gold, iron ore, quartz, limestone, manganese, kyanite and bauxite are some of the minerals that are found in Karnataka. After the closure of the Kolar Gold Fields mine, the only company in India that produces gold by mining and extracting it from the ore is Hutti Gold Mines Limited that has plants at Hutti and Chitradurga in Karnataka. The major mines of manganese and iron ore are located at Sandur in Bellary district. Visweswaraiah Iron and Steel Ltd. at Bhadravathi and Jindal Vijayanagar Steel Ltd. at Toranagal are engaged in the production of iron and steel. Indian Aluminium Company Ltd (Hindalco) has an aluminum plant near Belgaum. Mysore Minerals Limited is in the mining and production of chromite industry in Hassan district. Rajashree Cements at Adityanagar, Vasavadatta Cements at Sedam and The Associated Cement Company Ltd. at Wadi are engaged in the production of cement. Uranium deposits have been found in Deshnur, a small village near Belgaum. Karnataka is the leader in the information technology sector in India and its capital, Bangalore, is known as the Silicon Valley of India. In the IT sector, Karnataka generated a total revenue of ₹516.5 billion in the financial year 2006–07 which included ₹487 billion from software exports and ₹29.5 billion from hardware exports. A total of 1973 companies in the state are involved in Information Technology-related business. While the bulk of the IT related companies are located in Bangalore, some companies are located in Mysore and Mangalore as well. Bangalore is also the headquarters of Wipro and Infosys which are among the top three IT companies in India in regards to market capitalization. The Nandi Hills area in Devanahalli outskirts is the site of the upcoming $22 Billion, 50 square kilometre BIAL IT Investment Region, one of the largest infrastructure projects in the history of Karnataka. As of June 2006, Karnataka housed 55% of biotechnology related companies in India. Bangalore is also the home of the largest biocluster in India with total revenues of ₹14 billion and having 158 of the 320 companies working on biotechnology in India. Karnataka has a headcount of over 6,800 scientists involved in biotech research and out of twenty eight biotech companies that were registered in India in the year 2005–06, 27 were located in Karnataka. Karnataka, particularly the coastal districts of Dakshina Kannada and Udupi, is sometimes called the "cradle of banking" in India. This is because seven of the country's leading banks, Canara Bank, Syndicate Bank, Corporation Bank, Vijaya Bank, Karnataka Bank, Vysya Bank and the State Bank of Mysore originated in this state. The first five in the above list of banks were established in the districts of Dakshina Kannada and Udupi. These districts have among the best distribution of banks in India—a branch for every 500 persons. Between 1880 and 1935, twenty two banks were established in coastal Karnataka, nine of them in the city of Mangalore. As of March 2009, Karnataka had 5,759 branches of different banks servicing the people of the state. The number of people served by each branch was 10,000 which was lesser than the national average of 15,000, thereby indicating better penetration of banking in the state. The state is well connected to its six neighboring states and other parts of India through 14 National Highways (NH); it accounts for about six percent of the total NH network in India. Total traffic handled: 67.30 MTA. Total imports handled: 23.6 MTA. Total exports handled: 32.9 MTA. Area: 4,050 acres (16.4 km2). Third busiest airport in India (after Mumbai and Delhi). Runways: 5300 ft. (Asphalt) and 8,038 ft. (concrete). The only airport in Karnataka with two runways. Hassan–Sakhleshpura–Mangalore line gauge conversion is completed. Both freight and passenger trains run on this route on a daily basis connecting the seaport city of Mangaluru to the state capital of Bengaluru and Mysooru. Key connectivity projects, doubling of Mysore–Bangalore railway line, Gadag–Bagalokot, Bangalore–Hassan to be taken up in the near future. KPCL has an installed capacity of over 9315 MW. Independent power producers have installed capacity of 2,005 MW. KPCL -Karnataka Power Corporation Ltd. Transmission: Karnataka Power Transmission Corporation Limited (KPTCL). Transmission lines: 28,000 km,33 kV, 130,000 km of 11 kV. Source: ―Power sector at a glance as on July 2009‖, Karnataka Power Transmission Corporation Limited website, accessed 23 September 2009. Leading telecom companies in the sectors of telecommunication network, basic telephony services (both wire line and wireless) and networking services for telecommunication equipment are operating in the state. The entire State is networked via Optic FibreCables (OFC) by the state-run BSNL (formerly DOT) as well as private companies like Bharti, Reliance, VSNL and TATA Tele Services. Last Mile Access is provided by BSNL as well as TATA Tele Services in various parts of the state. Bhartiand Reliance Communications provide the Last Mile Access directly to the customer in all major cities in Karnataka. Seven new telephone exchanges were opened in 2007–2008. Active telecom service providers in Karnataka. BSNL, BhartiAirtel, Reliance Communications,Vodafone Essar, Spice Communications,Tata Teleservices Ltd.
Karnataka Industrial Area Development Board (KIADB) and Karnataka State Industrial Investment Development Corporation (KSIIDC) are jointly responsible for the development of industrial infrastructure in the state. IT/ITES cluster in electronic city and Whitefield (Bangalore). Biotech park/cluster in electronic city, Bangalore. The water supply is provided by the local authorities like municipalities and panchayats. The first hydroelectric plant in the state was built at Shivanasamudra Falls on the Kaveri River in 1902. Karnataka has an installed capacity of 27 gigawatts (GW) of electricity, of which 12 GW comes from renewable energy sources. The state is India's top producer of solar energy, with an installed capacity of 5.16 GW. Karnataka Power Transmission Corporation Limited (KPTCL) is the sole provider of electricity for the state. The Linganamakki reservoir will supply around 35 percent of power to the state. Electric power from KPTCL is distributed through distribution companies like Bangalore Electricity Supply Company (BESCOM), Mangalore Electricity Supply Company (MESCOM), Gulbarga Electricity Supply Company (GESCOM), Hubli Electricity Supply Company (HESCOM) and Chamundesvary Electricity Supply Company (CESCOM) for different parts of the state. A good number of windmills were present. The Raichur Thermal Power Station and Near Bellary (Kuduthini). Karnataka is also the location of companies like SELCO (India), which is promoting the use of solar electricity among the rural areas of the state and is also a twice winner of the Ashden Awards. ^ a b c d e f g h "Karnataka Budget Analysis 2019-20" (PDF). PRS Legislative Research. Retrieved 16 February 2019. ^ "State's economic growth poised at 8.2 per cent". Online webpage of the Hindu, dated 2011-02-24. Chennai, India: 2011, The Hindu. 24 February 2011. Retrieved 6 April 2011. ^ a b "Karnataka" (PDF). Online webpage of the India Brand Equity Foundation. Ministry of Commerce with the Confederation of Indian Industry. Retrieved 6 April 2011. ^ a b "STATE ECONOMY AND SOCIO-ECONOMIC PROFILE Karnataka" (PDF). Department of Commerce & Industry. India Brand Equity Foundation. Retrieved 30 September 2009. ^ "In terms of per capita GDP – Karnataka, Bengal fastest growing States". Online webpage of the Hindu, dated 2005-06-09. 2005, The Hindu. Retrieved 11 June 2007. ^ "Karnataka stands 3rd for FDI inflows in India after Maharashtra ,Gujarat". Online webpage of Deccan Herald, dated 2010-12-24. Bangalore, India: 2010, Deccan Herald. 24 December 2010. Retrieved 6 April 2011. ^ Government of India. "Employment and Unemployment" (PDF). Online webpage of Indian budget. Retrieved 19 June 2007. ^ "Budget 2006–2007". Online webpage of the Finance Department. Government of Karnataka. Archived from the original on 22 August 2006. Retrieved 2007-06-19. ^ "GSDP of Karnataka, Manufacturing Industries in Karnataka". www.ibef.org. Retrieved 25 June 2018. ^ a b c d e f g "Karnataka Agricultural Policy 2006" (PDF). Online webpage of Department of Agriculturesankalp. Government of Karnataka. Retrieved 4 June 2007. ^ a b "Karnataka Human Development Report 2005" (PDF). Online webpage of the Planning Commission. Government of India. Retrieved 4 June 2007. ^ "Area, Production and Yield of Coarse Cereals during 2004–05 and 2005–06 in respect of major Coarse Cereals Producing States along with coverage under Irrigation". Online webpage of DACNET. Government of India. Archived from the original on 29 September 2007. Retrieved 4 June 2007. ^ "Coffee data". Online webpage of Coffee Board of India. Archived from the original on 9 May 2007. Retrieved 4 June 2007. ^ "Bamboo in Sericulture". Online webpage: TECA – Technology for Agriculture. FAO, United Nations. Retrieved 4 June 2007. ^ "Silk city to come up near B'lore". Deccan Herald. 17 October 2009. ^ "International sports village location to be finalised soon". The Hindu. Chennai, India. 9 July 2009. ^ "List of Mining Leases in Karnataka". Online Webpage of the Department of the Mines and Geology. Govt. of Karnataka. Archived from the original on 11 April 2006. Retrieved 2007-06-05. ^ Amit Mitra. "Global mining houses on `gold rush' to India". Online Webpage of the Hindu Business line 2004-09-26. 2004, The Hindu Business Line. Retrieved 5 June 2007. ^ Madhumathi D.S. "Sandur Manganese set to clear dues". Online Webpage of the Hindu Business line 2004-04-10. 2004, The Hindu Business Line. Retrieved 5 June 2007. ^ a b c Chin S Kuo. "The Mineral Industry of India" (PDF). Online Webpage of the U.S. Geological Survey. U.S. Geological Survey. Retrieved 5 June 2007. ^ a b "IT exports from Karnataka cross Rs 50k cr". Online Edition of The Financial Express, dated 2007-05-22. 2007: Indian Express Newspapers (Mumbai) Ltd. Retrieved 5 June 2007. ^ "TCS topples Infosys as m-cap leader in IT space". Online Edition of The Economic Times, dated 2006-07-14. 2007 Times Internet Limited. 14 July 2006. Retrieved 5 June 2007. ^ "State Cabinet approves IT park near Devanahalli airport". The Hindu. Chennai, India. 29 January 2010. ^ a b c "Bangalore tops biocluster list with Rs 1,400-cr revenue". Online Edition of The Hindu Business Line, dated 2006-06-08. 2006, The Hindu Business Line. Retrieved 5 June 2007. ^ a b Ravi Sharma. "Building on a strong base". Online Webpage of The Frontline, Volume 22 – Issue 21, Oct. 08 – 21, 2005. 2005, Frontline. Archived from the original on 7 October 2007. Retrieved 2007-06-21. ^ Ravi Sharma (19 July – 1 August 2003). "A pioneer's progress". Online Edition of the Frontline. 2003, Frontline. Retrieved 21 June 2007. ^ a b "State/Union Territory-Wise Number of Branches of Scheduled Commercial Banks and Average Population Per Bank Branch – March 2009" (PDF). Online webpage of the Reserve Bank of India. Retrieved 22 September 2014. ^ "Places of interest – Sivasamudram". www.mysore.net. Retrieved 9 November 2006. ^ Tripathi, Bhasker (1 August 2018). "How Karnataka could become self-reliant in electricity in just 10 years with investments in clean energy". Firstpost. Retrieved 21 March 2019. ^ Athrady, Ajith (8 August 2018). "Solar energy: Karnataka earns top position". Deccan Herald. Retrieved 21 March 2019. ^ Kiran, Niti (13 April 2018). "Karnataka is the top solar state in India: Mercom Capital". Business Today. Retrieved 21 March 2019. This page was last edited on 3 April 2019, at 23:50 (UTC).